GDPR is a regulation created for all websites that operate and collect user data within EU members states. It is not required to collect consents from visitors coming outside of European Union. Click HTTP + GEO targeting button to see the code with included geo-targeting. Visitors from outside EU will not see cookie Popup in this case. It requires you to update Cookie-Script code on your website if you are not using EU geo-targeting yet. Geo-targeting does not work with self-hosted code since visitor IP is checked on Cookie-Script servers. Geo-targeting is available in paid subscriptions. This is final update of Cookie-Script to meet all GDPR requirements. Cookie-Script now allows you to collect and record visitor consents. The exact explanation of how it works will be published soon. How to enable visitor consent recording? You have to enable this option manually for existing items created before 2018-05-24. It is automatically enabled for all new items. 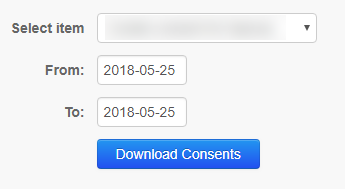 How to download consent log? A ZIP file will be downloaded automatically. Zip file contains a list of CSV files, one for each day for the chosen period. 1 Unique key that is saved in visitor's cookies. This key can be used to check if user actually gave consent. 2 User action (accept / reject). 3 Masked IP address of a visitor. Last digits are set to 0, so it is not considered as private data. As you can see, none of the data above can be considered private data, so you do not need any extra consent from user to use Cookie-Script. Consent record option is a part of new Pro payment plan due to extra server usage for constant consent recording. If you already have Premium membership, you only pay the difference between Premium and Pro (20 €). Just buy Pro as normal and discount will be automatically applied.